Central Midlands Regional Transit Authority (The COMET) was formed by the City of Columbia, Richland County, Lexington County and City of Forest Acres in 2000 and was given the responsibility for providing local transit service within Richland and Lexington Counties as a regional transportation authority under South Carolina Code of Laws, Chapter 25. The COMET contracts for operations and maintenance of transit services with Transdev, Enterprise, Bewegen, Uber and Lyft. Staff are directly responsible for planning, capital investments, financial management, and operations oversight. 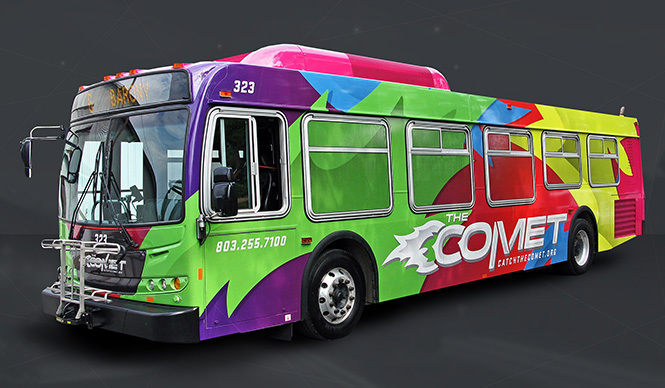 The COMET is financially supported by Richland County Transportation Penny Funds, Lexington County General Funds, State Mass Transit Act Funds, fares, miscellaneous and advertising revenues and Federal Section 5307, 5310, 5311 transit funds. we offer special packages for students and colleges. We need amazing people to help us do amazing things. View RFPs and Other Procurement Documents. Beat the Traffic with the SC Gamecock Express.